ExitCertified Corporation has once again ranked within Branham300’s list of Top 250 Canadian Technology Companies. ExitCertified Corporation is pleased to announce that it has once again ranked within Branham300’s list of Top 250 Canadian Technology Companies. This inclusion will mark the sixth consecutive year for ExitCertified. Over the years, ExitCertified has continually moved up the ranks on the Branham 300 list, currently standing at #126. The Branham300 is the definitive listing of Canada’s top publicly traded and privately held Information and Communication Technology companies, as ranked by revenues. It illustrates the depth and breadth of innovative technologies developed in Canada and is widely considered to be a leading source of intelligence on Canada's ICT industry. For 20 years now, the Branham300 has highlighted the top Canadian and Multinational ICT companies operating in Canada, as ranked by revenues. Branham Group Inc. is a leading industry analyst and strategic marketing company servicing the global Information and Communication Technology (ICT) marketplace. Branham Group assists ICT Technology companies and related institutions in achieving market success through its custom consulting services (Planning, Marketing and Partnering), and through its multi-client research subscription programs (Digital Health, Green IT and Cloud). 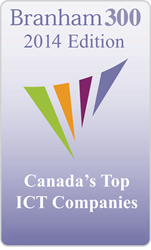 Branham also produces an annual listing of the top ICT companies in Canada (http://www.branham300.com) and monitors over 450 Digital Health vendors (http://www.branhamgroup.com/digitalhealth). ExitCertified is a provider of certified IT training in North America, authorized by hardware and software vendors including Oracle, Symantec, IBM, Red Hat, SAP, Apple, Hitachi, Pivotal, VMware, Cloudera, Brocade, Salesforce, AWS and HP. ExitCertified stands for Excellence in IT Certified Education, and is dedicated to delivering a premium education experience in advanced technology fields across North America. Training formats provided include Instructor-Led Classroom, Live Virtual Classroom, MVP™, iMVP™, and Self-Paced training. For more information about ExitCertified and its training offerings visit http://www.exitcertified.com.